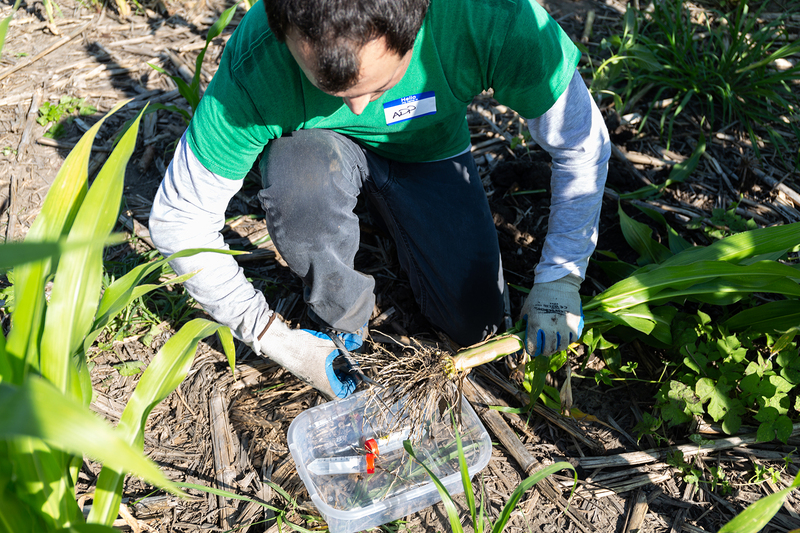 Alejandro Pages takes root samples from a research field as part of his Summer 2018 UCARE project with Dr. James Schnable. Are you interested in an undergraduate creative activity or research experience at Nebraska? The Undergraduate Creative Activities and Research Experience program supports undergraduate students engaged in research and creative activities under the guidance of a faculty mentor. If you’re a full-time undergraduate who will have completed at least 30 credit hours by May 2019, you may be eligible to apply for a UCARE undergraduate research assistantship for Summer 2019 or Academic Year 2019-2020. Summer UCARE 2019 applications are accepted through January 21 and students considering graduate school are especially encouraged to apply. Academic Year 2019-2020 applications will be accepted Feb. 4 to March 11. Find the application at https://ucare.unl.edu/apply-ucare. Summer UCARE recipients commit to 20 hours per week of research or creative activity and receive a $2,400 stipend. At the end of the Summer UCARE term, students present their research findings in a poster session at the annual Nebraska Summer Research Symposium. Skill-building seminars on topics like graduate school preparation and professional presentation skills are offered throughout the summer to enhance the UCARE experience. Academic Year UCARE 2019-2020 recipients commit to 10 hours per week for a $2,400 stipend and will present their research at the annual Spring Research Fair in April 2020. Skill-building seminars are also offered during the Academic Year term. Students must confirm a project and faculty advisor before applying. Visit the UCARE website for full eligibility requirements and to learn more about identifying a faculty advisor or developing your research proposal. Wednesday, January 9 at 3:30 p.m.
Friday, January 18 at 2 p.m.
Monday, February 4 at 4 p.m.
Tuesday, February 19 at 2 p.m.
You can also email ucare@unl.edu with any questions or make an appointment via MyPLAN with Justina Clark from the Office of Undergraduate Research.